A watercolored panel, using the Ditsy Floral stencil from Plaid. Laid the stencil on watercolor paper and colored the background and centers, leaving the flowers white. 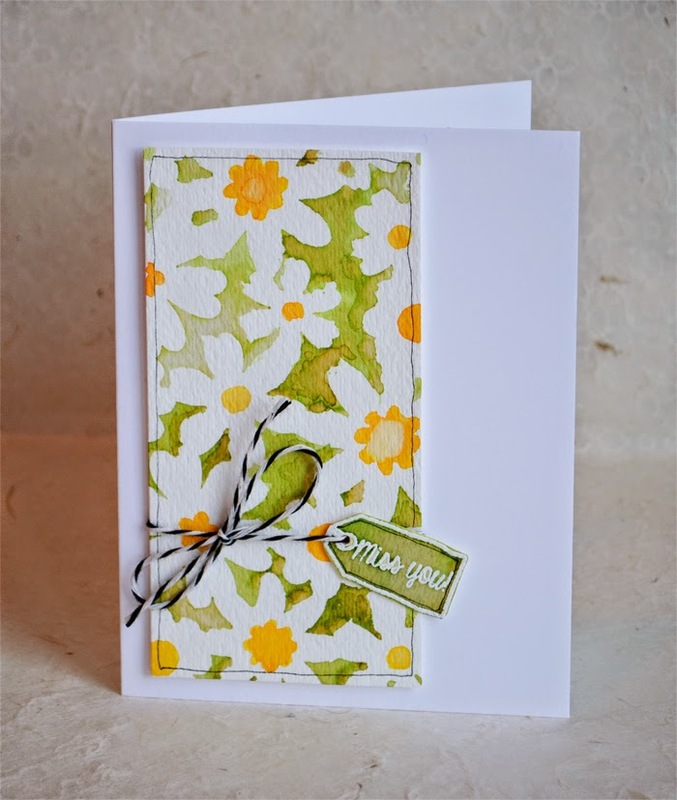 Used Ranger Peeled Paint distress ink for the background. It has a brown undertone, which wasn't the look I wanted, but it is growing on me. Used some markers for the centers -- rubbing the markers on an acrylic block and picking up with water and a brush. Tag is from Avery Elle Thanks a Bunch. Love that tag!! After you've inserted your photo in your post, click on it and click on "Properties". Type in your name or blog or whatever attribution you want under "title text" and "alt text." When someone pins your photo, your attribution will automatically appear in Pinterest. This card is gorgeous, Joan. What a clever way to use a stencil, and the results ARE dreamy! gorgeous....Love it and thanks for the tip! Great tip and beautiful card! Love the colorful panel against the white base. Really makes it pop! Thanks for the Pinterest tip. Thanks for the tip about Pinterest! And I love the touch of brown in your watercolor! The black and white twine adds just the right contrast. I would have never thought to do that, it's lovely. Thanks for the tip. Still haven't gotten back to blogging but if and when I ever do, this is a good tip. Love, love, love the card. Saving it to CASE in future. Love this! Favorite stencil I've seen so far, and the colors are wonderful. Interesting tip about the photos. Love this card! The black and white twine is perfect. Appreciate this information. Thanks so much Joan! This too I love - what a wonderful watercolour effect. It makes me think of summer holidays!! So gorgeous! I seem to be all about this color scheme today.